Hi! Lori here, welcoming you to another edition of Real English conversations from Better at English DOT com. This is the second in a three part series in which Michael and I discuss some of the differences between our British and American English dialects. This edition takes up right where we left off in part one, so if you are a new listener you might want to go back and listen to part one before you listen to part two. In this podcast, we focus on some pronunciation differences between British and American English, as well as one potentially embarrassing difference in vocabulary. But before getting into the conversation, I want to thank you again for your continued support of Better at English: Alberto and Yuichi, I received your generous donations this week—thanks so much! So to all listeners out there, if you get value from my podcasts, please consider making a donation; see the link in the sidebar at www.betteratenglish.com for all you need to know about how to donate. And as always, on the website you’ll find the full transcript and a vocabulary list. OK, let’s get on with it, shall we? Michael: Well, I think that would be the same for me if someone was just a sharp intake of breath like when you take your car, to the garage, and you say, and they tell you how much it’s going to cost to have your exhaust fixed. And you respond with [gasp], that’s what you would do. L: Exactly. It’s funny you said garage. M: That’s, I think, is a regional thing with English people. Because you could say garage or garage or garage. People would understand you in English; it just depends whereabouts in the country you come from. M: Yeah, oh yeah. And your lawnmower, and things like that. M: It…that’s what we would call it in England too, but also it doubles as where you take your car to have it fixed, to have it repaired. But if you said that you were taking your car to the shop in British English, they would look at you really funny. Like thinking you’re going to sell your car in a shop; you don’t have it fixed, but they would understand workshop, you know, that engineers and mechanics work in a workshop, but a shop in British English, it’s where you sell something, newspapers and things like that. L: Yeah, so that could be a misunderstanding, then. M: Oh yeah definitely, definitely. L: But, I mean, wouldn’t you be clever enough to figure it out? Don’t they know enough about American English from TV and things like that to… to pick up on that? M: I think so, I think so now because there’s so much of the TV in England, are American programs, and if you want to understand what’s going on you just have to get up to speed with what people what people say and the names they have for things, so I think most people would be able to figure it out, umm, but I can’t speak for everybody. L: It’s funny, there’s a lot of expressions in British English and American English that can completely…screw you up if you’re not careful. One of my very, very favorites is the word rubber. L: Can I borrow your rubber? Have you got a rubber I can borrow? L: Yeah I know but, I mean, isn’t that what… because I learned…and I learn most of my British English from, from reading and from these English teaching materials and vocabulary lists that you have, because it’s almost always based on the British English model. And in these teaching materials a rubber is what I would call an eraser, what you use to rub out pencil marks, or erase pencil marks. But what do you call it, you know, spontaneously with what you know about British English, would you call it, a rubber or an eraser? M: It’s quite funny that you brought this up, because when I was young I would, without even thinking, we’d just talk about this as a rubber, you know, I need a rubber. When I was a child we used to write in pencil at school and so everyone, every school child, had to have a pencil and a rubber—this was important equipment for going to school. But it was only when I went to secondary school in England that I realized that rubber could actually mean something else, and particularly in, with American English. And so I had to consciously start calling it an eraser, and that actually felt really false. L: Oh funny! You say you eraser and I say eraser. Do you hear the difference? M: Oh did I say that? Oh yeah, eraser, eraser. Yeah I say it with as if it’s a Z (zee). Or a zed, as we would say. You call it a zee, We call it a zed. You know, eraser. M: But yeah, I have to consciously do that because to me, to be honest, it’s still a rubber. L: … the first thing that comes to mind when I hear the word rubber used as a noun, for like, a thing, is a condom. M: That’s right that’s it that’s it it’s a slang word for a condom, yeah. L: Yeah! And I can just imagine the, you know, unintentional fits of merriment that could occur at a business meeting if you said, “Oh darn! Can I borrow your rubber?” If you were sitting there with a bunch of Americans, that they, you know, they might laugh at you. Thanks for tuning in to this edition of Real English Conversations here at Better at English dot com. You’ll hear the rest of Michael’s story in part three. Until then, I wish all of you the best for 2007. Stay inspired, stay positive, stay focused on what’s important to you, and don’t let fear of the unknown keep you from seizing the opportunities that come your way. If you’d like to leave feedback about the site, you can email me at info AT BetterAtEnglish DOT com, or leave a message on my voicemail line at 1 (for the USA) 206 350 2283. And don’t forget that your donations make this podcast possible, so if you are feeling generous please visit the website www.betteratenglish.com and make a donation. Your support does a lot to keep me going. Bye for now! Funny is a tricky word in English, because it has two different meanings: amusing/humorous/comical or strange/unusual. Something is funny in the amusing sense if it makes you laugh. Something can be funny in the strange sense it is unusual, weird or strange. Sometimes the distinction is not entirely clear, because some events that are weird or strange can also be rather amusing! For example, seeing a man wearing nothing but a chartreuse glittery tophat running (streaking!) through a crowded football stadium is probably funny in both senses of the word. At least Lori would think it was. To be up on something means to be well informed about it, to know a lot about it. To figure something out means to understand something or find a solution to it, usually after a lot of thought. To pick up on something means to notice something and understand it or make sense of it. To understand what is going on means to understand what is happening or what something is about. To get up to speed on/with something means to learn what you need to know about it. This is one of many phrases you can use to show that what you are saying reflects your own experience or opinions, and that other people may have different opinions or experiences. If something screws you up, it causes you problems, difficulties, trouble, confusion or (in the worst case) causes you to fail at what you are trying to do. In American English, a rubber is an informal (and rather vulgar) word for a condom. 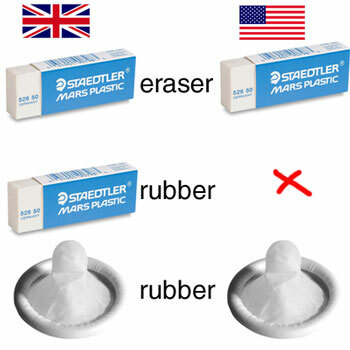 In British English, a rubber can mean either an eraser or a condom. An eraser is a piece of rubber or soft plastic that you use to rub out (delete) pencil marks. To bring something up means to mention it or introduce it as a topic of conversation. A fit is a sudden and uncontrolled period of doing or feeling something. Merriment is when people laugh and have a good time. Lori means that Americans who don’t know that a rubber is an eraser in British English might (involuntarily) laugh at you if you ask to borrow a rubber. I still have to buy a bunch of Christmas presents (countable). There is/are a still bunch of people I have to buy Christmas presents for. (Bunch is a collective noun (like group, committee, jury, etc. ), so verb agreement is up to how the speaker views the bunch — as a unit or a group of individuals). This entry was posted in British vs. American English, Intermediate, Listening, podcast, Real English conversations by Lori.